The first step was making the cake. The birthday girl was apparently a chocolate lover, so chocolate cake was the way to go. I used my most popular mudcake recipe, layered it with a chocolate buttercream and covered it with a whipped chocolate ganache. Here’s something you might not know about me: I hate cutting cakes. I don’t really know why. 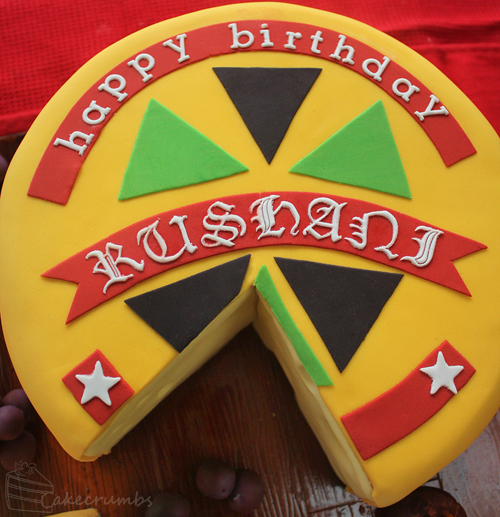 Most people I make cakes for or who come to events of mine with cake will ask me to cut the cake. I always shove the knife into Cameron’s hands and make him do it. 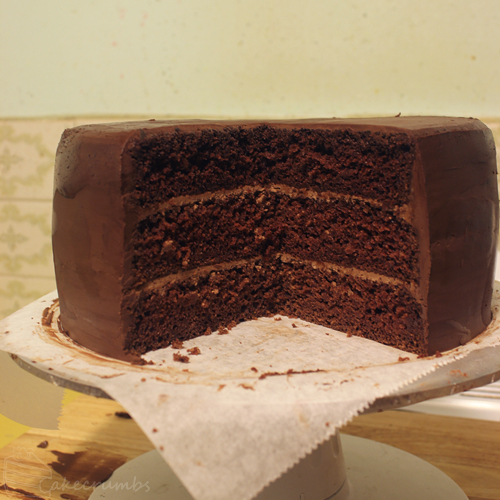 It makes me weirdly nervous, so I was really apprehensive about cutting into this beastie. 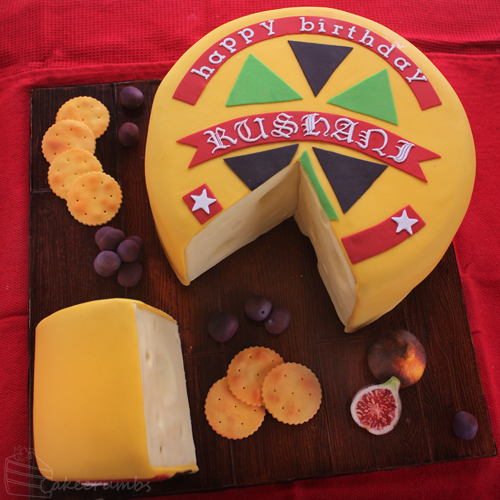 But it wouldn’t look like a wheel of cheese cake without a piece missing so it had to be done. Initially the customer gave me a reference image for a wheel of Jarlsberg. Now, I can’t sell cakes that have anything lisenced in it without written permission so I said I couldn’t replicate the logo. They wanted a birthday message somewhere on the cake as well so I suggested making the happy birthday message in the style of a logo instead. The most difficult part was placing it so it would still be a coherent birthday message with the slice removed. I decided to have the 21st part separate while keeping the rest of the birthday message in tact. 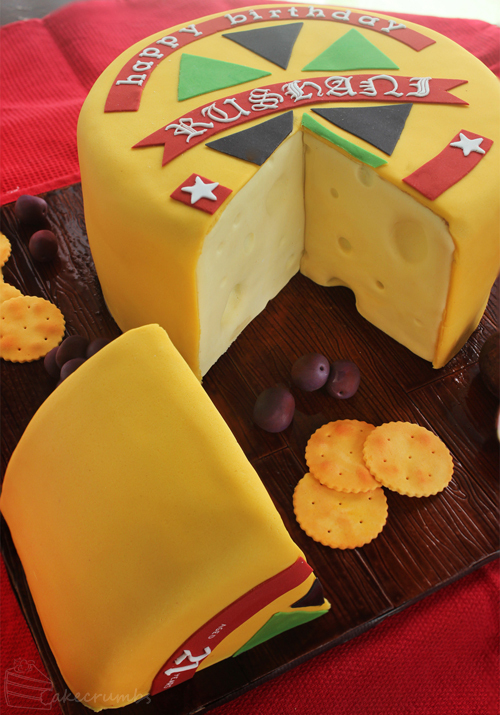 I also offered to have the cake sitting on a textured wooden cheeseboard instead of a plain old cake board. We only discussed the wooden texture, but as I got into it I wanted to add a little extra detail. Now, I spend a lot of time trying to make food into edible versions of inedible things. But turning sugar into edible versions of things that are already edible was definitely something unusual for me. Through deviantART I’ve met and befriended a lot of amazing crafters, some of which are astonishingly skilled at turning clay into minuscule versions of realistic-looking food. One of them is a lovely lady, Talty, who I spent some time sharing Community Volunteer duties for the Artisan Crafts community with. Her miniature food stuff is amazing and you should totally go peek at it. Clay and fondant work share so much in common, right down to the tools we use, and I spent most of my time wishing I could borrow her experience with clay food. 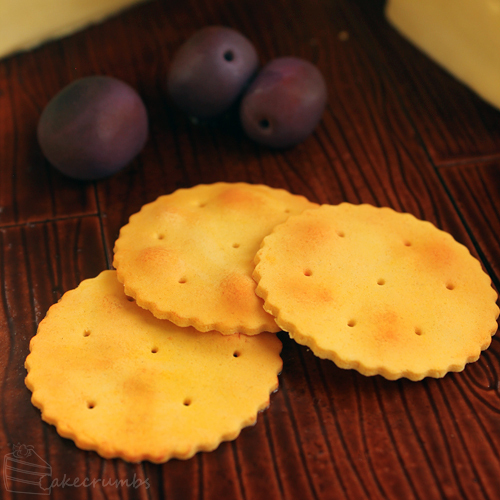 First up were the crackers and the grapes. The grapes were a bit easier. A simple shape that only required painting in different shades of reds and purples to give some depth. The crackers were a little trickier. I kept playing with ways of adding texture and colour until, on the third try, they started to look kinda like the real thing. 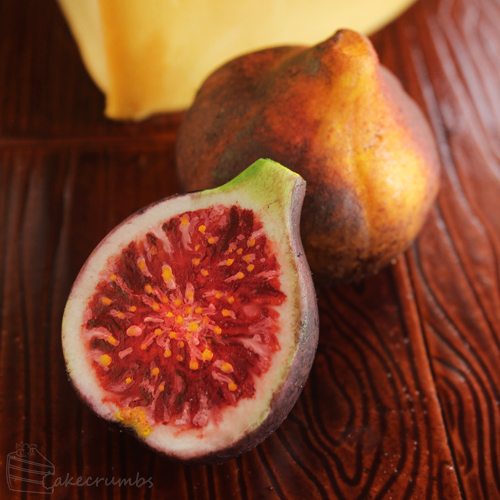 Lastly I decided to add some figs, as they were the second type of fruit I kept seeing on photos of cheese platters. They were a lot more difficult to paint and I spent a lot of time adding and removing colour to try and achieve something that looked fig-ish. The inside in particular didn’t become the perfect picture of stunning realism that I imagined in my head, but they hopefully ended up resembling the fruit enough to be distinguishable. Maybe if you squint a bit you can pretend it looks totally realistic. After the cake was done I sent photos to the customer and received a completely ecstatic reaction. After the pick up and party she sent me a bunch of photos of her very excited sister with the cake. She told me it was a huge success and that everyone loved it, but especially the birthday girl. Amazing! 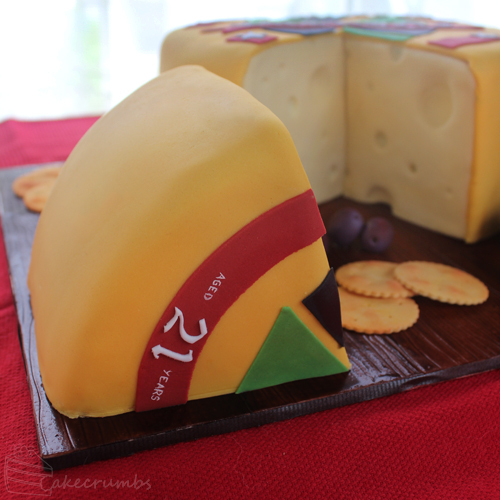 The “Aged 21 Years” wedge/slice is brilliant. Wonderful details. Beautifully done! I was expecting a cheesecake, but you created a cheese cake! Haha, yes the space between the words is imperative there! Which made it especially difficult to explain in verbal conversation. This is beautifully, excellently, creatively done, down to every detail. I am beyond impressed! So did everyone I tried to explain it to in person! It led to some very confusing conversations. Thank you for you lovely words! Absolutely Amazing, you are so talented! Thank you so much — that means a lot! I wanna be like you, when I grow up! Naw, you’re always the sweetest! I loved the detail and thought that went into this creation. Impressive work as usual!